EMU Inflation Continues to Stay Under Wraps While the ECB Waits for the World to Change...Will It? EMU inflation is even weaker upon its final revision. In February the HICP fell by 0.1% with core inflation up by 0.1% even the three-month pace of inflation is below 1.5% at 1.4% with the core pace even weaker at 1.2%. 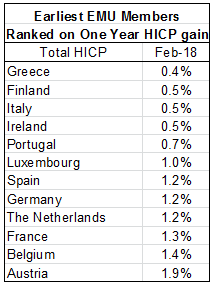 In February the policy-targeted twelve month change in the headline HICP weakened to 1.1% from 1.3% last month and the year-on-year core HICP stayed at 1.2% for the second month in a row. The ECB has been making plans to exit its stimulative polices. It has even retracted language about how it stands ready to engage in more stimulus if it is needed. Granted, activity data have begun to look much better, firmer, more solid. Economic expansion seems to have settled in. But the ECB does not manage macroeconomic policy the way the Fed does. The ECB mandate is a laser focus on inflation. I don't think that means that the other data are really irrelevant but as an order of importance other sorts of reports are much diminished. Still, what the ECB has now is a policy dilemma since inflation at one point seemed to be headed toward its JLT-2% target (just less than 2%) and then it began to falter (see Chart). It is also true that the growth rate for real money balances has slowed in Europe. There are not any concerns at this point about growth in Europe since the activity data are so uniformly firm-to-strong. But money growth adjusted for inflation is weakening its growth. Credit growth is still tepid and is weak in inflation-adjusted terms. Moreover, inflation itself just can't seem to really get started. The next block of countries consisting of Luxembourg, Spain, Germany, the Netherlands and France has inflation in the 1% to 1.3% range. Belgium has inflation at 1.4% and only Austria has inflation close to (or at) the ECB's objective of JLT2% inflation. Inflation really is not gaining traction anywhere even when broken down into 3-month and six month periods. EMU total and core inflation are no higher than 1.6% on these horizons. And the 1.6% gain is for the headline over 6-months and that pace falls to 1.4% over three-months. Core inflation is not accelerating as it is up by 1.2% over 12-months and over three-months and it does dip to a 1% pace over six-months. Looking at the largest four economies a bit more closely, Spain shows headline inflation rising from 1.2% over 12-months to 2.3% over 6-months to a 3.3% pace over 3-months. France has inflation at 1.9% over 6-months but the toothpaste goes back into the tube with a pace tailing off to 1.7% over three-months. German inflation is steady at 1.2% then dips to a 0.4% pace over three-months. Italy's pace of inflation is below 1% throughout these various horizons. The ECB has been helped to keep inflation in line by labor costs. Wages and salaries have risen at a 2% pace over the last year with wages and salaries in industry at a 1.7% pace. Meanwhile, adjusted for productivity gains, unit labor costs show a rise of just 1% overall and they are falling at 0.5% annualized rate for industry excluding construction. Although unemployment across Europe has been falling and in Germany the unemployment rate is at a post reunification low, labor market pressures simply are not building. We have not yet heard any voices of prevarication in Europe as inflation has retreated on its own. Of course, that partly reflects the fact that European policy change still is in abeyance. Unlike the Fed the ECB has not started to back track on policy; it has only been giving verbal queues about its intent. What has happened is that we have stopped hearing the public protestations of the Germans and Dutch about how policy needs to get moving to a more restrictive phase. In the US there are only three of the understaffed FOMC members who are making any noise about inflation's continuing undershoot there. For the most part the Fed seems on track for a March rate hike and for a plan for three-to four rate hikes for this year. But three Fed members Mr. Evans, Mr. Bullard and Mr. Kashkari are a bit concerned that inflation is still below its target rate. Does it matter? For the ECB it has been a slugfest to convince the Germans and other monetary hawks that inflation's undershoot could be a problem that the central bank need concern itself with. Even in the face of deflation many in Europe were content that inflation was still below 2% and did not see the price weakness as a problem per se. While the ECB's target for inflation rate is for "just less than 2%" some on the ECB board are happy with anything below 2%. So in Europe there is less of a feeling that being below target poses a credibility problem. Some just see it as another bit of evidence that proves that the central bank is guarding against inflation acceleration. But in the US the Fed takes its target as a more specific goal. The Fed has embraced the idea that it should actually hit its target. Not hitting its target is either a problem for Fed credibility or a problem for its technical competency. Not long ago the Fed began making the point that its target is symmetric. There has been no such language out of the ECB since is target is not symmetric. Inflation is supposed to be less than 2% and by how much less is a matter for speculation and apparently occasional argumentation. In the US the question of reaching its target has elements of credibility in various respects but there is also a question of whether the inflation rate actually matters for growth. The Fed has argued that the economy does best with inflation at 2% but I know of no studies that actually produce that as a result. Still if it is true might that not also have some applicability for Europe? It is hard to know. But as long as the economies are growing I doubt that there will be much complaining. Of course, if growth proves to be a flash in the pan this issue might surface. In the US it may be surfacing again as some of the growth optimism in the wake of the Trump tax plan has waned. The consumer has come up lame with retail sales falling for three straight months. GDP-now-casts are revised lower and are coming in at 2% or less for Q1. It is amazing how a change in environment can affect what people think or how they think about the future. Of course, some economies in Europe are geared to do well on low inflation. But there are only some like that. Is reasonable question to ask how some of the other countries will react if inflation remains below its objective. Let's hope that this is something we don't have to find out about. But it is a real question and one that is increasingly coming into play in the US.